I am discouraged by near endless stories of people who wrong society and care little because they value financial gain above all. It doesn’t matter if it is an unethical business person or a dishonest politician dealing out favors or a person in authority using influence to escape consequences of wrongdoing. I read about nefarious activities and write about them too often. That led me to examine the archives where I recalled this feel good story. It is about a woman who is about as opposite as one can get from sleazebag influence peddlers who play their lives on a much different ball field and play a much different game. This was first published on Northern Insights in September 2009. In the intervening time, Kathy Barnard’s foundation has helped many to get on with life and consoled the families of those who did not have that choice. It is spring time, good moments to read about this cause and appreciate a fine hero in our community. Good fortune on occasion will present to us a person able to reveal and demonstrate powerful elements of human character. Not by ostentatious actions, nor simple affectations. Instead, through fostering knowledge, educating people and working selflessly to mitigate pain and, most importantly, inspiring others, friends and strangers alike. By serendipity, one of those people crossed my path last evening. Again. Kathy Barnard hails, as wife Gwen and I do, from Powell River. Born to a family of proud Scots, her father, Dave Westie, was an important leader – 26 years as Pipe Major – of the internationally famous Powell River Pipe Band. Westie family members were also known for athletics in our small town and Kathy excelled at most everything, particularly baseball. She played Little League from age 9 and switched to women’s softball as a teenager. Typical of small town youth, we moved to the big city for the adult portions of our lives. Gwen and I raised our kids on Vancouver’s North Shore and Kathy, with husband Scott, made the same choice. Also from Powell River, Scott had lived down the street from me and, with his twin brother, was a neighborhood brat during my teen years. After much time, we met the Barnards again at an early season hockey tryout. Afterward, we crossed paths regularly at hockey rinks and baseball fields as our sons grew and occasionally played as teammates. We got plenty of time to talk and share thoughts about kids’ sports as we sat clutching hot coffees in cold rinks or dodging raindrops at ball fields. Kathy, like most athletes, took sport seriously. But, first of all she was a Mom, aiming to ensure that every kid on a team got challenge, training and opportunity. She was competitive but had the game and the children in proper perspective. 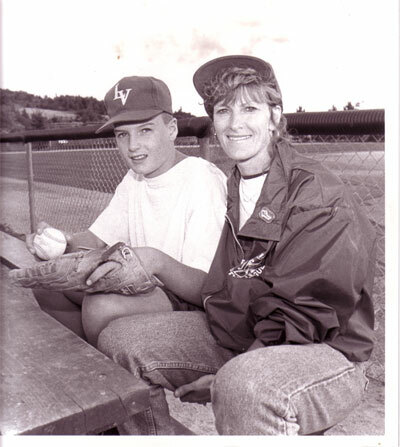 Kathy loves baseball in particular and was a coach of North Van’s champions who, with her son Spencer included, represented Canada at the 1993 Little league World Series. She was the first women ever to play that role in the event’s then 47 year history so of course every Williamsport appearance led to a media scrum. Later, she coached my younger son in league play and encouraged my older son to take up coaching as one of her assistants. She made her professional career at ICBC and stayed involved in sports, coaching the B.C. women’s baseball team in the Canadian championships as well as community ball. In 2003, Kathy, returned from participating in the World Masters Games in Melbourne, discovered that she had malignant melanoma. Kathy has been battling in her matchless way, supported by family and a loving circle of friends. In addition to aggressive treatment, she was involved in forming the Save Your Skin Foundation. Its goal is to raise awareness of skin cancers and provide melanoma patients with information about available treatment options, including hard-to-find trial options. Gwen and I encountered Scott and Kathy on the street, by chance, on a recent day. We were escorting two grandchildren so had important little people to put on show. We chatted for a while and learned that Kathy’s medical fight continues but the Foundation she treasures is making a difference for many. I relate this personal story in the hope that readers of Northern Insights will take time to visit the website of the Save Your Skin Foundation. Learn about skin cancer and the steps you can take to protect yourself and the people you love. Read survivor stories, including that of Kathy Barnard herself. If you choose to support the Foundation, that assistance will be applied with diligence and care by people who have been giving to our community in many ways for many years. Remember, courage is the foundation of integrity.